Set down the board horizontally and begin by working on the lower half. Use the hammer and one of the nails to make four small pilot holes where the screws will go (click to enlarge the photo below). The exact position of the screws is not crucial as long as there’s plenty of room for the alligator clips that will be attached. Take eight of the alligator clips (the last four will be needed in Step 9), and use the needle-nose pliers to bend the two small tabs at the ends of each clip outward. When you’re done, the end of each clip should be flattened (see photo below). Put a washer on each of the screws, and screw the screws about halfway into the pilot holes. Put the flattened ends of two alligator clips under one of the washers. Position the clips so that they point in opposite directions, parallel to the length of the board, as shown in the photo in Step 1. Tighten all the screws until the clips are held firmly in place between the washers and the board. Now, working on the top half of the board, hammer all eleven nails about 1/2 inch (1.2 cm) into the board, surrounding the two batteries and keeping them in place as shown. Adding a nail between the batteries will let you choose whether to use one battery or two to power the lightbulbs as you explore. Point the negative ends of the batteries (the flat ends) toward the left. Cut three individual bulbs from the string. Cut the wire halfway between adjacent bulbs so that each bulb ends up with two reasonably long wire leads that are equal in length. You’ll end up with three separate lightbulbs, each with wire leads at both ends. Use the wire strippers to strip about 1/2 inch (1.2 cm) of insulation from the ends of the wires coming from each of the lightbulbs. Set them aside for use in the activities below. Now strip the insulation from the ends of the three additional pieces of wire. Set one piece of wire aside for use in the activities below. The other two will be attached to alligator clips in Step 9. Use the needle-nose pliers to firmly attach the four remaining alligator clips to two of the pieces of wire you stripped in Step 8. A good way to do this is to poke the stripped end of the wire down through the hole near the back of the clip, so the insulated part lays in the curve of the clip between the two tabs. Then bring the stripped end of the wire up around the clip and lay it on top of the insulated part of the wire. Finally, bend the two tabs down on top of both the stripped and the insulated lengths of wire to hold them tightly in place (click to enlarge the photo below). This should ensure both a good electrical connection and a good physical connection. Finally, use a marker or pencil to number the clips 1 through 8 (see photo below) to help you keep track of your observations. Keep a bulb between clips 6 and 7. Replace the wire between clips 1 and 5 with a second bulb. Then replace the paper clips between clip 4 and 8 with the third bulb. All three bulbs should light and glow with approximately the same brightness. (If one of the bulbs is very much brighter or dimmer than the other two, remove it and replace it with another bulb.) How does the brightness of these bulbs compare to the brightness of the single bulb in the initial setup? Remove one of the bulbs from the circuit without replacing it with a wire or paper clip. What happens to the other two bulbs? Try replacing the bulb you removed, and removing another one instead. Does it matter which one of the bulbs you remove? Set up the circuit in its original form (see the photo in Investigation 1), with just one bulb. Move one of the alligator clips from a nail at the end of the battery holder to the nail between the batteries. What happens? Remove all bulbs, wires, and paper clips. Connect one of the alligator clip leads from the end of the battery holder to clip 1, and the lead from the other end of the battery holder to clip 6. Connect bulbs between clips 1 and 5 and between clips 2 and 6. What happens? Remove one of the bulbs. What happens now? Put back the bulb and remove the other one. What happens? Does it make any difference if you remove one bulb or the other? How does the brightness of the single bulb compare with the brightness of each of the two bulbs? How does the behavior of the two bulbs differ from that of the three bulbs that were connected differently? If the bulb doesn’t light, check to see that the nails are in firm contact with the ends of the batteries, and that all the connections are secure. The most common problem in a circuit is a bad connection. Also, be sure that the batteries are not dead! Both wires and paper clips act as good electrical conductors. You can use whichever is most convenient whenever you want to connect two clips. In Investigation 1, which uses one bulb, electrons come out of the negative end of the left battery to begin their journey through the circuit. They travel through clips 2 and 1, the wire, clips 5 and 6, the bulb, clips 7 and 8, the paper clip, clips 4 and 3, and back into the positive end of the right battery. This path is called a complete electrical circuit. Batteries are rated in volts, and volts are a measure of the energy that electrons have when they leave the battery. As electrons travel through the complete electrical circuit, we’ll assume that the only place they lose energy is in the bulb, where their energy is transformed to the light and heat given off by the bulb. The process of energy transformation resists the electron flow through the bulb, and the bulb is said to have electrical resistance. It is very important to realize that while an electron loses energy on its trip around the circuit, the electron itself doesn’t leak out of the circuit or disappear. For every electron leaving the battery to enter the circuit, another enters the battery from the circuit. In Investigation 2, three bulbs are connected in a way that forces electrons to pass through all the bulbs to get back to the battery. This is referred to as a series connection. When three bulbs are connected in series, each bulb glows less brightly than one bulb alone. This is because three bulbs provide more total resistance than one bulb. This decreases the total flow of electrons, called the current, and results in a smaller amount of energy being transformed to light and heat. Additionally, each bulb only gets one-third of this reduced amount of energy. When you remove one bulb in a series circuit, the others go out. It doesn’t matter which one you remove. When you create a gap in the circuit the electrons can no longer flow. When you move one of the battery clips to the nail between the batteries in Investigation 3, the circuit is powered by one battery instead of two. The total amount of energy available is cut in half, so the bulb gets dimmer. In Investigation 4, the configuration is changed so that the electrons arriving at clip 1 now have two alternative paths to get to clip 6. Bulbs connected in this fashion are said to be connected in parallel. If the two lightbulbs are identical, half the electrons will go through one bulb and half through the other. The electrons will then recombine into one flow at clip 6 and return to the battery. When two or more bulbs are connected in parallel, all the bulbs will be as bright as a single bulb. This is because each additional bulb provides another path for electron flow, and each electron only moves through and loses energy in one bulb. The alternative paths actually reduce the total resistance in the circuit. In fact, the resistance of two identical bulbs in parallel is half the resistance of a single bulb, allowing twice as much current to flow in the circuit. When one of the bulbs in the parallel circuit is removed, there is still a closed loop, so current flows through the other bulb and it stays lit. 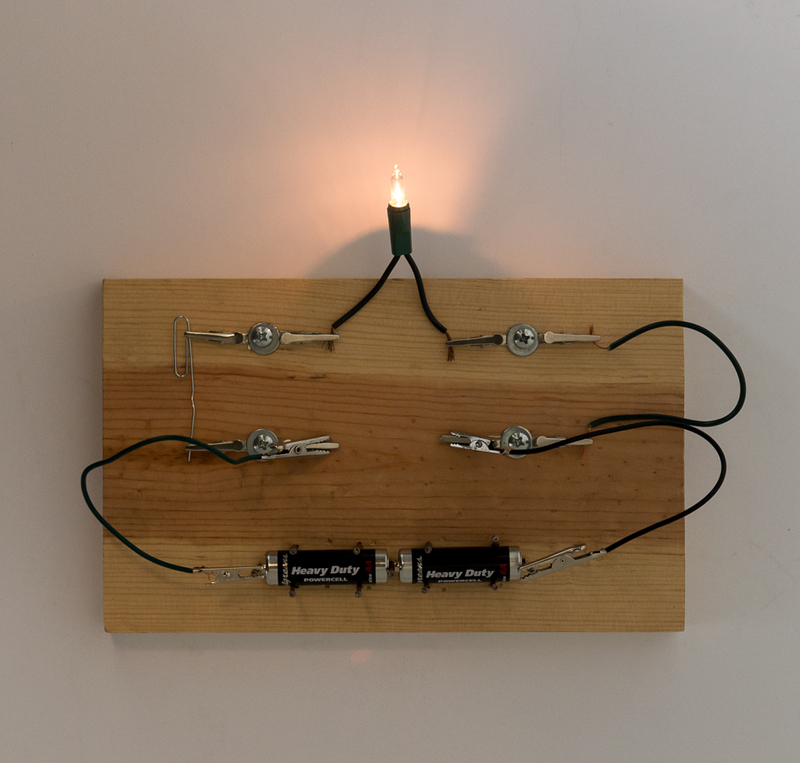 From these experiments, you’ll be able to see that removing any one of the bulbs in a series circuit makes all the bulbs go out, but removing one or more of the bulbs in a parallel circuit has no effect on the remaining bulbs. You’ll also discover that the more bulbs you place in series, the dimmer each one gets, whereas adding more bulbs in parallel has no effect on the brightness of any of the bulbs. Do you think the circuits in your house are wired in series or in parallel? If you have a toaster and radio plugged into the same outlet, does the radio go off when the toast is done? The fact that you can turn electrical items in your house on and off individually tells you that your circuits are wired in parallel. If this were not the case, then one burned-out lightbulb would mean all the other lights on the same circuit would go off, too. In some textbooks, the direction of flow of electric current is defined as the direction positive charge would flow, which would be through the circuit from the positive terminal of the battery to the negative terminal. In reality, however, positive charges do not move in wires. It's the negatively charged electrons that move, and they flow through a circuit from the negative terminal of the battery to the positive terminal. The definition of current as movement of positive charge has historical roots, and continues in use; current defined in this way is often called “conventional current.” In some situations (e.g., movement of charged particles in semiconductors, solutions, and gases), positive charges do actually move and contribute to electric current. For beginning work with simple circuits, however, it's easier to deal with electron flow. In this Snack, we've used the terms “current” and “electron flow” interchangeably. Experiment further with your circuit board. How many bulbs can you connect in series? How many in parallel? Try putting a bulb in series with two bulbs that are in parallel. This is called a series-parallel circuit. Try to think of a way to connect a third bulb in the circuit so that all three bulbs will retain their maximum brightness, and any one or two of them can be removed without the third one going out. Try some arrangements of your own design. Notice the paths that the electrons can take in the circuits you set up, and see if you can understand the behavior of the bulbs in these circuits. Use a multimeter (a meter that measures both voltage and current) to measure the voltage and current in the various circuits you set up. Use your breath to make a visible change in an electric circuit. Measure the efficiency of solar cells. Try building these circuits found in everyday objects.